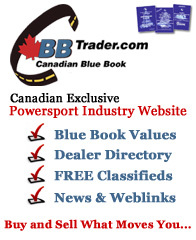 The Canadian Blue Book, an All Seasons Publications book, offers motorcycle value verification for Ontario motorcycle riders based on average motorcycle sales prices, as well as the MSRP (Manufacturers Suggested Retail Price) for those motorcycles. It also contains Ontario motorcycle dealership contact information for dealerships across the province. Riders Plus Insurance uses the Canadian Blue Book as a valuable resource, and we hope that you will find it informative and useful as well.